Rasa, Sheila Gallagher’s video of a three-dimensional model of an 18th century miniature Kangra painting also addresses the blending of human and divine love. 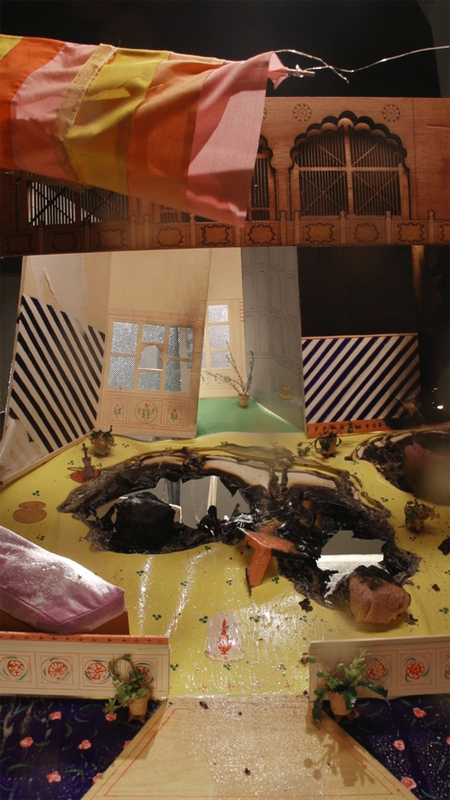 Filmed in one shot, Gallagher’s constructed set, including hand-painted walls and bonsai plants grown and pruned over several months, is slowly engulfed in flames accompanied by a soundtrack sampled from sound clips of love scenes from Western films. Rasa, a Sanskrit word that can be translated as “essence”, “juice” or “spiritual rapture”, also refers to an emotional response of a viewer evoked by a work of art, a kind of “aesthetic love of love.” In Rasa, Gallagher re-imagines an amorous encounter between RadhaKrishna, the love union which exemplifies the highest form of the soul’s ascent in certain branches of Hinduism. Rasa both instantiates the scene and Gallagher’s response to the painting, while nodding to the limits of her western subjectivity. Sheila Gallagher was born in 1967 in Morristown, New Jersey. She received her BA from Connecticut College in 1989 and her MFA from the School of the Museum of Fine Arts, Boston in 1996. Her work has been exhibited at the Museum of Fine Arts, Boston, MA; Institute of Contemporary Art, Boston, MA; and Tisch Gallery, Tufts University, Medford, MA. She was the recipient of the Buttenweizer Scholarship, Young American Scholar, and Thomas J. Watson Foundation Fellowship. She was a finalist for the Institute of Contemporary Art/Boston Foster Prize, St. Botolph Foundation Distinguished Artist Award, and the Museum of Fine Arts, Boston Maud Morgan Prize. Gallagher’s work has been reviewed in Art in America, Hyperallergic, Bloomberg, and The Boston Globe, among others. Her work is included in the collection of deCordova Sculpture Park and Museum, Fidelity Investments, the Philadelphia Eagles, and Wellington Management. She has lectured and taught at Massachusetts Institute of Technology, Wellesley College, Harvard University, Saint Gaudens, Museum of Fine Arts, Boston, Institute of Contemporary Art/Boston, and is an associate professor of fine arts at Boston College. Gallagher lives and works in Jamaica Plain, Massachusetts.